For success of the project, it is necessary to engage with project stakeholders early in the project. No, I am not saying early in project execution, it is early in planning phase. Ideally when project scope, objectives are defined, project budget is set and project charter is prepared. If project manager is engaging stakeholders (especially project sponsor), everyone will have a clear common understanding of what can be expected when a project gets delivered. Do They Have Realistic Expectations? Help Them. If you as project manager do not see certain deliverable unrealistic, speak up; let the stakeholders understand why it is not realistic, what are limitations, what are alternatives and options. You will have to walk them through those restrictions and alternatives, help them understand the realities. Customers and stakeholders will be receptive to hear transparent views early on and in realistic manner than later in the project. If you have issues with project plan, schedule, resources, budget; let stakeholders be aware of it. Better to highlight these issues early on than saying sorry later. Any miscommunication and surprises will push project manager under pressure. As a central project management authority, you need to establish a common communication mechanism, a platform to let stakeholders raise request or flag issues. The easiest way to manage such expectation is by start using right project management software; the project management tool that will show same schedule to every other stakeholders (depending on access), in real time with actual progress. Using this project management tool, project sponsors should be able check project timeline, project dashboard, project reports in real time, at any time. Project team members should get notified whenever there is any change in the schedule or they should be able to update task progress, issues/risk status easily. More importantly, this project management software should become a common communication platform that will keep everyone informed of appropriate project progress, or actions expected. What Can You Expect When You Start Managing Project Stakeholders Expectations Well? Can ZilicusPM help? Yes, absolutely. ZilicusPM is an online project management software that enables everyone easily access their project activities anytime from anywhere. ZilicusPM makes project communication nearly real time – all project timeline, progress/status updates. 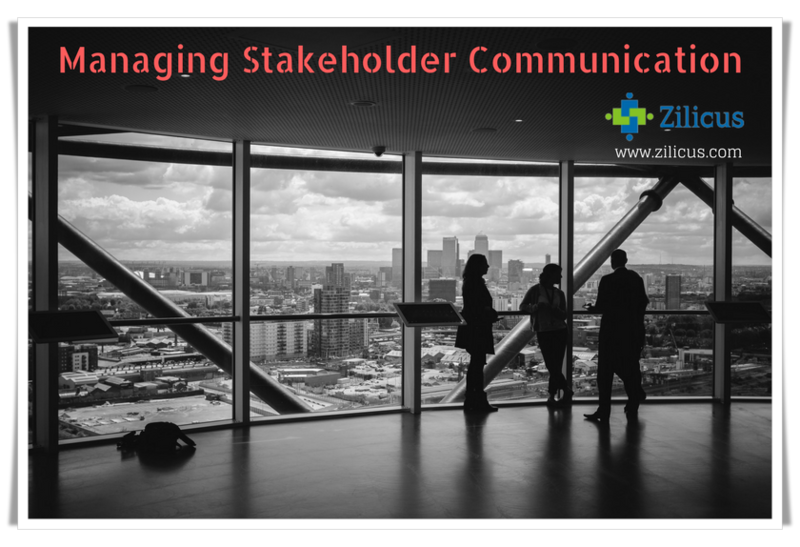 How Does ZilicusPM help you manage project stakeholder expectations? ZilicusPM is complete online project management software that provides a common platform for all project stakeholders to access and update project timeline, issues, risks, budget, cost, expense, meetings, documents, timesheet, and much more. ZilicusPM project management software is simple to use, easy to access. It lets project manager clearly identify priorities for project tasks, issues, risks. Team members can clearly view these priorities and due date as they logon to ZilicusPM and act on these. As team member update progress of project tasks, issues, risks or meetings, it reflects for everyone accessing same project workspace. Project manager can keep track of who is working on what activities, what is the progress of given task, issue or risk. Project sponsors can get health/status of project progress using clear and stylish project dashboard. You can optionally invite them to project workspace so that once they logon to ZilicusPM, you can involve them during project execution. Customers over 90 countries are using ZilicusPM to manage projects. If you start using ZilicusPM, you have got the best way to identify and collaborate with project stakeholders. ZilicusPM keeps everyone informed of project schedule, project status, pending activities & way to update those. It establishes the best platform to engage stakeholders for clear and transparent project communication and effective project management.